The launch of Games for Windows Live coincides with the release of Halo 2 for Vista. The PC equivalent of Xbox Live is to launch in the US on 8 May. The service will be called Games for Windows Live. Details on the UK launch are expected to follow shortly. The launch will coincide with the Windows Vista launch of Halo 2 and will allow PC gamers to compare scores with their counterparts playing the game on Xbox Live . Shadowrun and Uno, coming later in the year, will support full cross-platform interplay between Windows Vista and Xbox 360. 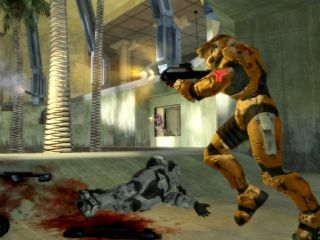 Halo 2 won't allow interplay between platforms, but Windows Vista gamers will be able to challenge each other in PC-to-PC matches as well as communicate via voice or text with other Live members. You can use a single gamertag and friends list across both platforms, and members of Xbox Live automatically receive access to Games for Windows Live. "Five years ago, we began building a service that now defines the bar for online gameplay," said Peter Moore, head of the Interactive Entertainment Business at Microsoft. "We're enhancing the online experience for PC gamers who have long desired seamless game and voice connectivity - it's a win for everyone." Like Xbox Live, Games for Windows Live is broken down into two levels of service: Silver, which is free to users; and Gold, which in North America costs $49.95 per year (identical to the cost of Xbox Live Gold). For more details pick up the story at our sister site computerandvideogames.com.